For over a decade, clients have sought Mr. Lall’s advice in implementing strategic wealth plans that encompass a well-balanced approach to investing. Mr. Lall heads the Risk Assessment division. He has been responsible for entrenching the firms core principles and philosophy to clients. With the help of his team, they analyze and diligently review quantitative and qualitative risk for the betterment of client portfolios. Prior to co-founding LPS Financial, Mr. Lall started his career as an Associate at Raymond James Financial and then as a Senior Financial Consultant at a boutique firm on Wall Street. Gaurav and his wife Vaishali have been happily married since November 2009. 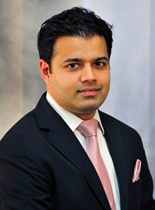 Mr. Lall graduated from the College of Staten Island, with a Bachelor of Science in Finance and Economics. His professional credentials include his series 7, 63, 65, licenses and is also a Licensed Life Insurance Agent.